Ok now you guys know I am not one to do many little “food craft” things on this blog. My patience is not set up correctly to handle such projects. However Isaac begged me to make these little adorable burger cupcakes and he’s been doing so good in homeschool this week I couldn’t resist. Besides, look at them? Don’t you just wanna grab one and sink your teeth into them? I couldn’t wait for that moment! 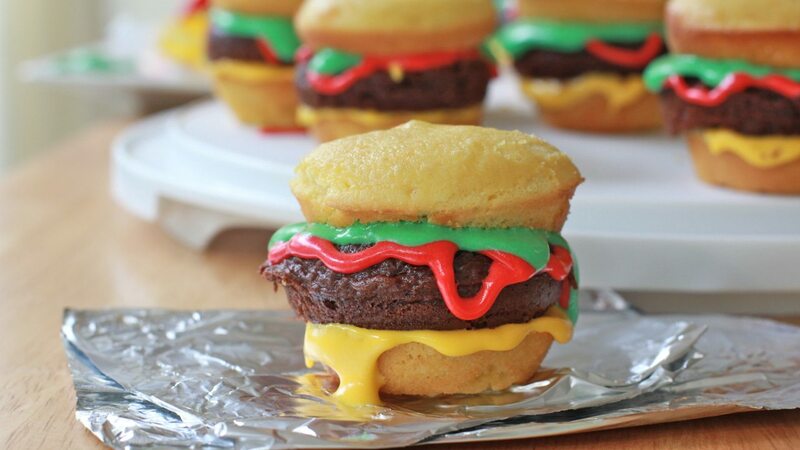 After making these burger cupcakes I now have a love-hate relationship with them. Something is really cruel about these little things and I’ll tell ya exactly what it is. It’s total mind fake-out! And I’m not sure I like it. Your eyes see these yummy looking burger cupcakes and you expect to be met with an explosion of epic flavors & textures just like with a real burger. Even though you know full well that it’s cake you still take that first bit hoping for a flavor mecca and then…it’s just cake and frosting. Even my husband was like “Oh. Ok…it’s a cupcake with icing” which translates to “I’m not really that impressed”. Hahaha kinda funny. They’re good and all, don’t get me wrong…I mean…it’s a cupcake with frosting for crying out loud. 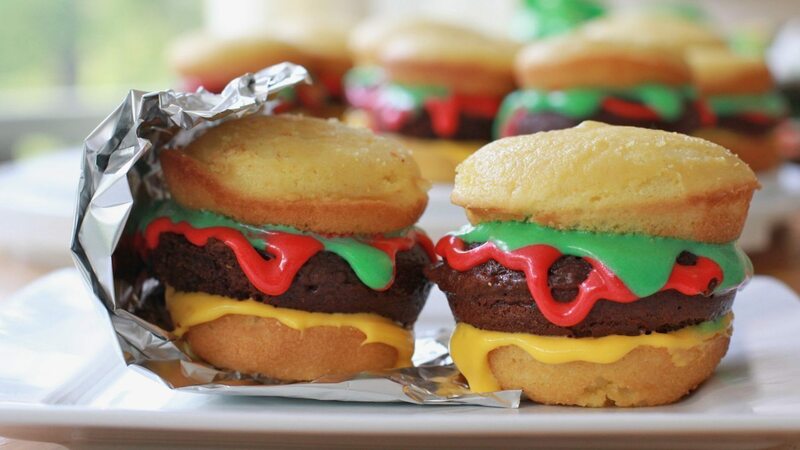 These burger cupcakes were certainly a lot of fun to make and pretty doggone easy for my frosting challenged self. The boys LOVED them and thought they were so cool! So for that reason I’m posting them on this blog. So now other parents can make them for their kids, only to get a little sad inside after that first bite while their kids jump for joy. Next time I make them I think I’ll use a sheet of brownies for the burger part (I wanted more texture) and I’ll go ahead and do the dyed green coconut for the lettuce (sorry hubby). Cheat! To make this project easier you can totally cheat here by using a box cake mix or buying unfrosted cupcakes and also using frosting in a tube. These cupcakes are more about the cutesy factor than winning a blue ribbon. I have this theory though that if you’re using a box cake then at least make a homemade frosting and the other way around. But hey, that’s just me! Brush the top of the buns lightly with sugar water and then sprinkle on some sesame seeds!! 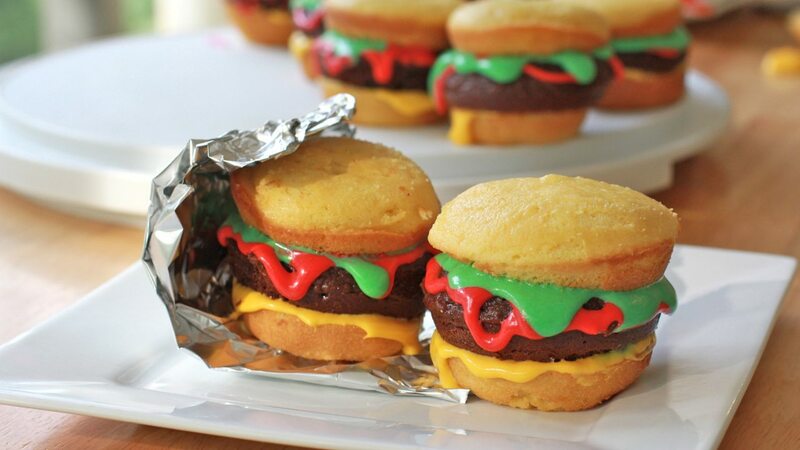 This make these burger cupcakes look so realistic! FYI: Sesame seeds are found in the spice aisle of most grocery stores. I was too lazy to run out to the store to get some though. Get creative!! If I was making this for some one besides my kids I’d definitely use homemade cakes and frosting. I’d also use squares of yellow fondant for the cheese and dyed coconut for the shredded lettuce for a more realistic presentation . And ditto to those sesame seed! Have FUN!! These hamburger cupcakes really is a lot of fun to make and I totally see why so many folks are making them! 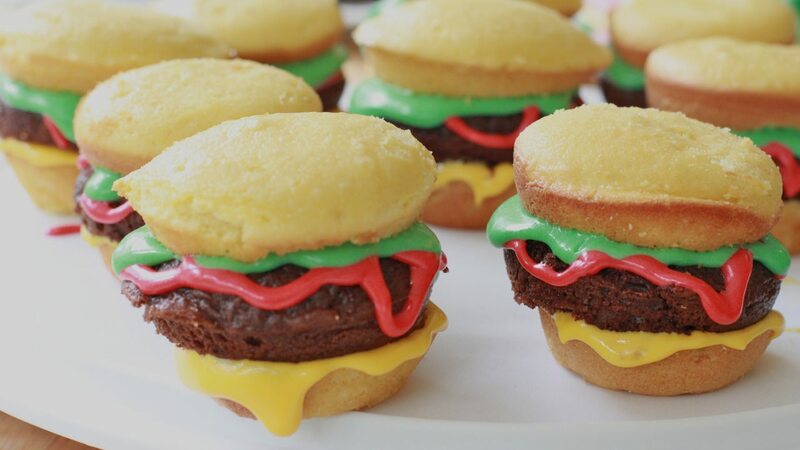 Watch me make these burger cupcakes from start to finish! When cupcakes are done, remove from pan and place on a cooling rack. Slice the yellow cupcakes in half to create the bun. Slice the tops off of the chocolate cupcakes to create the burger. Divide the prepared frosting into 3 bowls. Place the bottom bun on a flat surface. Pipe on the yellow frosting along the rim of the bottom bun. Drizzle ketchup along the outer edges of the burger. Pipe the lettuce around the outer edge of the burger. Top with the top bun. If desired, brush the top bun lightly with sugar water and sprinkle on sesame seeds. You'll have leftover cake from the chocolate cupcakes and maybe a few "rejects" from the yellow cupcakes. You'll also have some leftover frosting! All the ingredients needed to make cake pops!!! Oh wow! These look pretty amazing. Not sure if I want a cupcake or a burger after seeing them so I might just have to have both (followed by two back to back trips to Planet Fitness.) Can’t wait to try this recipe!